Defensor is a highly-rated, superior-quality, horizontally-scrolling, shoot-them-up game for the Windows PC. Defend the planetoid against alien invasion. Protect the humanoids from abduction and more. Destroy the waves of multiple alien bug types, all with individual characteristics, collect bonuses and power-ups, and prepare to battle the mother alien. Due to the dynamic nature of the graphics, with fast, smooth, multi-layer, parallax scrolling, static screenshots just cannot do justice to the game. Original version programmed in 2003. "Again one of those blockbuster games when the title says it all. The Defensor's aim is to defend people from alien monsters coming down from the sky. The game is quite tricky since you have to collect a certain score to win the level and move to the next one. It doesn't really matter how many monsters you killed; it matters how many stolen people you saved. Also if you kill a monster carrying a human being several feet above the ground it's okay but if that human being was released from the killed monster very high he or she will fall to the ground and obviously die. So you will have to catch a falling person and carry him/her to the ground getting a bigger score all the time. The graphics of the game are nice; there are no special effects, crazy sounds, 3D animation, just plain and simple defending mission. Fans of space adventures and wannabees with romantic intentions will definitely love the game." The humanoids that inhabit this tiny planetoid are a race of non-violent people. They have lived in peace with each other for over five millennia. Unbeknownst to them, however, a nasty swarm of alien bugs has discovered their lovely planetoid, and is hell-bent on taking it over. Thankfully, the humanoids have you to defend them! You are the commander of a fast, highly maneuverable, laser-equipped ship. The ship is also equipped with a limited supply of smart bombs that can destroy all alien bugs on the current screen (good in emergency situations), and a hyperspace button to instantly teleport your ship to a random location on the planetoid (good for escaping from a tight situation). Patrol the planetoid airspace to protect the humanoid inhabitants from the alien bugs. Keep an eye on your radar at the top of the screen - the entire planetoid surface is displayed (in miniature) on the radar, so it gives you a good feel for what is happening throughout the planetoid. Make sure that you learn what each blip on the radar represents (humanoids are the green/yellow blips). Advanced Defensor commanders have been known to look more frequently at the radar than at the actual screen! If an alien bug (an abductor) abducts a humanoid, fire your laser to destroy the bug, and rush to the aid of the falling humanoid. You should then transport the humanoid back to the surface of the planetoid, as only humanoids that begin falling from a short distance above the planetoid surface might land safely back on the surface on their own. Avoid inadvertently firing at the humanoids - there are only ten humanoids to begin with, and you do not want to contribute to their slaughter! If an abductor succeeds in transporting the humanoid to the top of the screen, the humanoid will be killed instantly; the abductor then transforms into a more deadly mutant that will home in on your ship. Alien bugs such as the weavers are just as nasty. They descend onto the planetoid surface to weave cocoons out of captured humanoids. After a period of time, these cocoons hatch to release little alien swarmers; naturally, the humanoids will be killed when this happens. Destroy the weavers before the cocoons hatch, and you can save the cocooned humanoids. Spinners dangle from the sky on a web-like thread, also on the lookout for humanoids. If a spinner comes into contact with a humanoid, its fatal bite will kill the humanoid instantly. Bombers do not seek out humanoids but they lay bombs along the path that they travel. Avoid (or destroy) these bombs as they are primed to explode. Alien pods float innocently around in the sky, but will release a horde of swarmers when destroyed (may require several laser shots). Swarmers are suicidal in nature, and tend to home in on the player’s ship. They are difficult to destroy due to their diminutive size. Chasers only appear towards the end of a level if you have been too slow in destroying the alien bugs. Dancers appear in a linear flock of ten and prance around the screen, only to fly off the screen after a period of time. 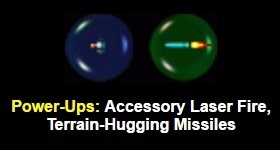 Shoot all ten of the flock while they remain on screen and you will be rewarded with a power-up to collect (such as an accessory laser or two, or terrain-hugging missiles). Power-ups (green lasers and missiles) have no effect on the humanoids (but, of course, firing your original red laser on a humanoid will still kill the humanoid). Occasionally, bonuses will become available to collect. To select which bonus you wish to collect, you may repeatedly shoot at the bonus first to cycle between the types of bonuses before you collect it. The alien bugs are, of course, not simply sitting ducks, waiting for your laser fire! They can defend themselves by firing back at you (quite accurately, unfortunately), so watch out for the alien fire, as these will drain your shield. Don’t collide with the bugs too, as the collision will also drain your shield. If your shields are completely drained, you lose a ship. You have three ships to begin with, but a new ship will be awarded at 30,000, and another at 80,000, points. It’s “Game Over” if either all the humanoids are killed, when the planetoid will explode, or if all your ships are destroyed. If you succeed in destroying the waves of alien bugs in each level (you do not need to destroy any remaining chasers), you progress to the next, more demanding, level. Bonus points will be awarded at the end of each level, based on the number of humanoids that survived the level. A huge end-of-level mother alien appears at the end of every five levels that will require multiple shots to destroy – persist in destroying the mother alien, as you will be well rewarded. You are also awarded ten new humanoids after completing every five levels. Good luck on your noble quest, commander! The Menu screen allows certain selections to be made (e.g. view Instructions screen), or options to be changed (e.g. joystick versus keyboard control). Move the rotating star cursor by using the [up & down arrow/cursor] keys on the keyboard (or by using the joystick if the joystick option is selected). To make a selection, press the [Enter] key (or joystick button 1). To change an option, use the [left & right arrow/cursor] keys (or joystick). The game defaults to keyboard controls, but all the latest settings will be saved on exiting the program. If joystick control is selected, use the joystick to control the direction of movement of the ship, joystick button 1 to fire the laser (and missiles, if you are fortunate enough), button 2 to use the smart bomb, button 3 to hyperspace, and button 5 to toggle between pause and resume. If keyboard control is selected, you may wish to redefine the keys. In the Menu screen, navigate the (rotating star) cursor to the Controls option; press the [Spacebar] to enter the Key Definition screen to redefine the keys. Some players may prefer to use a key to move left and a key to move right, while others may prefer to use a key to thrust the ship forward in the direction that the ship is facing and a key to reverse the direction of the ship – both options are catered for in this program. The program will not allow you to redefine two different functions to any one key. Press the [Esc] key at any time during the game to exit the Game / Instructions / High Score screen.